Would you like to join us in a Novena to St. Joseph, ending on his solemnity on 19th March? Every evening at his altar we are meeting as a community to listen to a short reading, say the first prayer below and sing 'Sancte Joseph' in his honour. Perhaps you would like to unite your own special intentions to ours, remembering in particular the Universal Church at this time. (The background music on this page is actually this hymn - words given below). 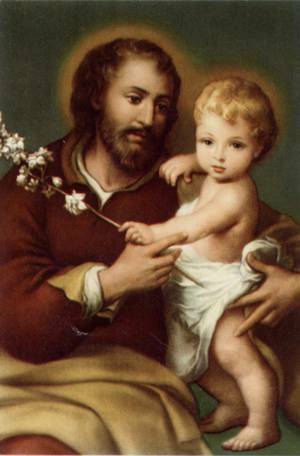 Holy Father St. Joseph, Protector and Guardian of our Order, bless our Carmel, that it may ever be pleasing to God. Through your powerful intercession, make it flourish and grow in numbers that, in union with Mary, we may truly love and serve the Church, and grow in love of Him Who, for our sakes, became your Son. Who lives and reigns for ever and ever. Amen. Almighty God, you have chosen Saint Joseph to be the mainstay of Jesus and Mary, the wise and faithful servant in whom they could trust. We pray that he may truly be the guardian of your Church; that he may inspire with confidence those who are devoted to him; that he may give security to those who work in the vineyard of Your Son; and finally, that he may be a source of strength to us, who wish, like him, to dedicate ourselves to Christ's service, now and in times to come. Amen. Sancte Joseph, Sancte Joseph, Sancte Joseph, ora pro nobis nunc et in hora mortis, in hora mortis nostrae, Sancte Joseph, ora pro nobis. "I took for my advocate and lord the glorious St. Joseph and earnestly recommended myself to him.... I don't recall up to this day ever having petitioned him for anything that he failed to grant.... It seems that the Lord wants us to understand that, just as He was subject to St. Joseph on earth, so in heaven God does whatever he commands."